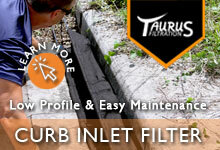 The downspout filter is one of the easiest ways to filter runoff from rooves, houses and buildings. Designed to attach directly to the bottom of a downspout, these filters work to remove harmful pollutants before water ever hits the ground. All models are designed with a hard exterior and a replaceable interior filter cloth. Questions about downspout filters? We can help! Call our team at 1-772-646-0597 or fill out our quote request form to discuss your requirements. How Does This Product Keep You in Compliance?